Fans have served as accessories of fashion and objects of utility since antiquity, but reached their peak production and use in Europe in the eighteenth century. Made from and embellished by an abundance of precious materials, such as ivory, tortoiseshell, mother-of-pearl, enamel, and silver and gold leaf, these multifaceted objects were the result of a meticulous and laborious fabrication process. Due to the guild regulations of the time, the fabrication of a single fan involved several dozen craftsmen, ranging from leaf designers to stick carvers, gilders to assemblers, who each contributed to the fan’s form, design, and artistic quality by their specialty. 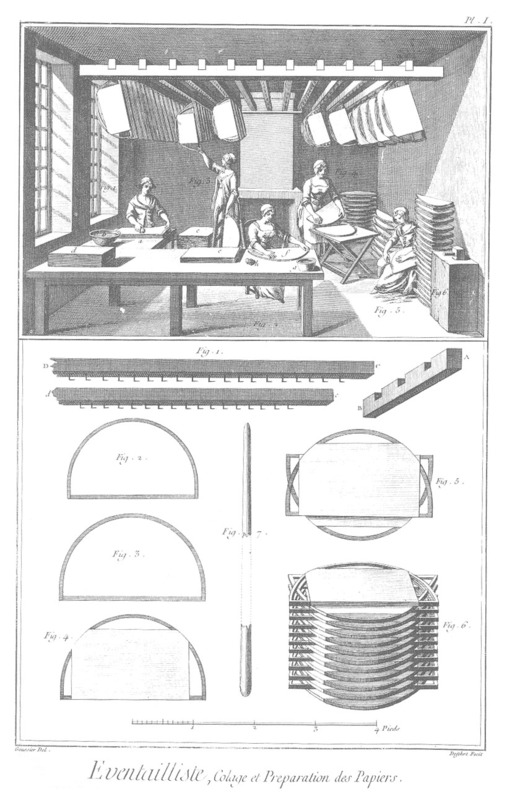 The 1765 edition of Denis Diderot’s Encyclopédie, ou dictionnaire raisonné des sciences, des arts et des métiers illustrates many parts of the fan making process. 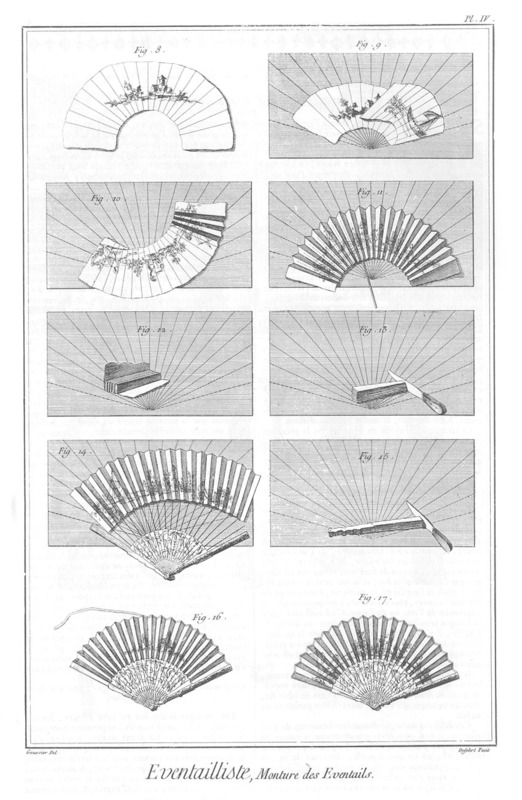 In the process of making a folding fan, the material for the fan’s leaf was prepared first. Vellum (a fine parchment made from the skin of a calf, lamb, or kid) was typically used in fan leaves during the early eighteenth century, but by the century’s end, paper was more often used. Vellum was limed to remove hair, grease, and fats, and then scraped, stretched, and pumiced until smooth. Throughout much of the eighteenth century, paper was made by hand from linen or hemp rags, which were sorted by type and then dampened. The wet rags would rot over the course of several months, before being cut into small pieces and crushed into pulp. The pulp would then be beaten until the fibers matted together and a sheet of paper was formed. These sheets would be pressed and dried several times to remove water and secured the matted fibers, and sized to shape, treated with solution to make them impermeable, and scraped to remove imperfections. Once the leaf was prepared, it was given to a painter for decorating. Eighteenth-century fan designs were often rendered in oil or opaque watercolor paints, and then accented with gold and silver paint. The designs were positioned to accommodate the curve of the leaf, and typically featured small vignettes on each side of a central figure or scene. Motifs often included scenes of current social and political interests and issues, Biblical stories or mythological tales, and romanticized domestic and pastoral vignettes that mimicked, or sometimes reproduced, paintings by contemporary artists. The fan’s structure was formed by sticks, topped by ribs that pass behind a single leaf or in between double leaves, and guards (or end sticks). Often these were made from mother-of-pearl, derived from the lining of oyster shells, and ivory, from the tusks of elephants from Africa or Asia. Sometimes both materials were used in combination; a contemporary Italian fan from the Museums collection shown here features thin mother-of-pearl sheets applied to its carved and incised ivory sticks, to sumptuous effect. The creation of the fan’s structure from such precious materials was a complex process, requiring that the materials be sawed, filed, shaped, carved, and incised to achieve the correct form as well as aesthetic effect. Once complete, the sticks and guards were secured together with a rivet at bottom. Fans of the Eighteenth Century–now on view in the T.B. Walker Textiles Education Gallery–explores the process of eighteenth-century fan production in Europe through a selection of fans from the Museums’ permanent collection. They are contextualized by fan designs and portraits, with sitters be-fanned, from the collection of the Achenbach Foundation for Graphic Arts. The exhibition’s examination of the production and consumption of luxury consumer goods, as well as contemporary courtship and fashion, intersects with many of the themes of the special exhibition Casanova: The Seduction of Europe at the Legion of Honor, to which it is presented as a complement. This article was first published in the Textile Arts Council newsletter. Learn more about the Textile Arts Council of the Fine Arts Museums. du Mortier, Bianca M. Fans and Fan Leaves, 1650–1800. Amsterdam: Rijksmuseum Amsterdam; Zwolle: Uitgeverij Waanders, 1992. 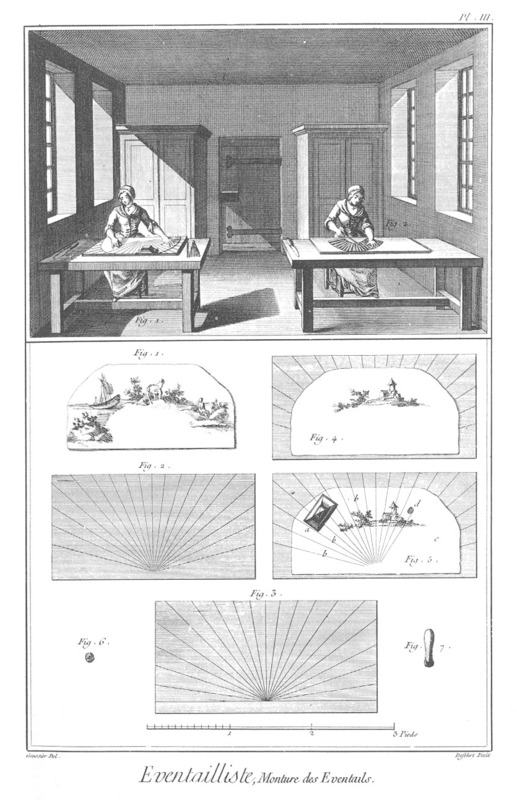 Encyclopédie, ou dictionnaire raisonné des sciences, des arts et des métiers, etc., eds. Denis Diderot and Jean le Rond d'Alembert. University of Chicago: ARTFL Encyclopédie Project (Autumn 2017 Edition), Robert Morrissey and Glenn Roe (eds), http://encyclopedie.uchicago.edu/.